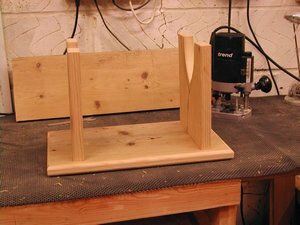 After being so impressed with the miller dowel, I decided to build one of these step stools. It's a great simple project and can easily be completed in a day or two. 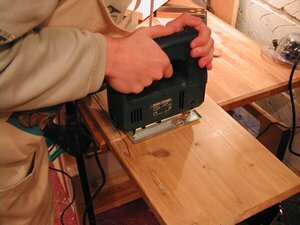 The idea of this, was to construct it entirely with the miller dowel, I have used no screws, nails or other woodworking joints. The miller dowel, as reviewed here can be brought in the UK or USA from woodworking stores, details are on the review. 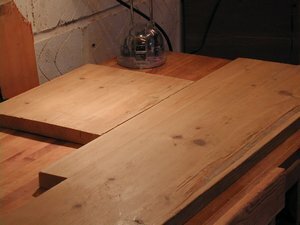 As the title shows, this project is going to be made from reclaimed pine. I choose this material mainly because of its mellow colour and character. 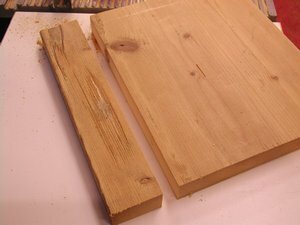 Also, these boards are more than wide enough, and stable. You will notice, one of my boards has a large defect running down the side. This I cannot get round, its a price you pay when working with reclaimed wood, however some would argue that is adds character to the piece. The first step is to mark out the 3 key parts. The top and then the 2 legs either end of the stool. 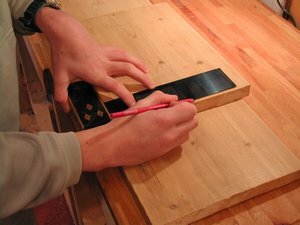 All of this will come from my wide boards, if you are working with new wood you may need to glue up 2 or 3 boards to match this width. 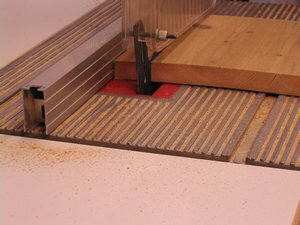 I could use my sliding mitre saw here or even the table saw to crosscut, but to prove it can be done I am using a humble jigsaw. Dare I say it, you could EVEN use a hand saw..! 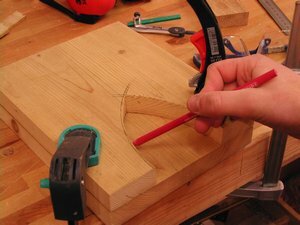 This project is so basic, you do not need expensive or fancy tools to come up with attractive results. The 2 leg ends need to be thinner than the top, this is part of the design, I am using the tablesaw to rip these down for speed - again I stress you can use a more basic tool to do this with. 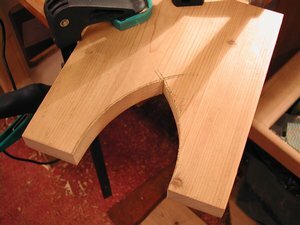 I marked out this "gothic arch" shape with a pair of compasses. I then cut it with my jigsaw. 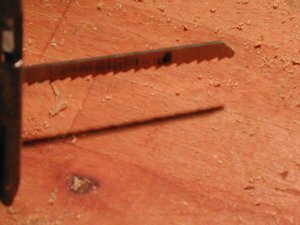 I used a sharp fine blade in my jigsaw, for curves especially these are good, they will allow greater control and cut more accurately. The teeth are much smaller and closely spaced than a regular jigsaw blade, thus producing a finer cut. Internal curves such as these can prove awkward to sand by hand, so the less cleanup needed - the better. I have clamped the 2 parts together, and I am using the leg I have just cut as a template, drawing around it will ensure the 2 ends are the same. 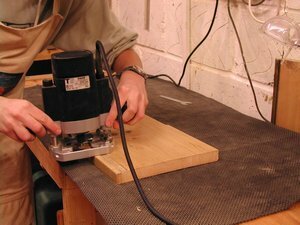 The top has been dimensioned, and I am now using the 1/4" router with a rounding over bit to take off the sharp corners. This I feel will also make the top a lot more visually pleasing. Now I have the 3 key components shaped to size. There is one more part I need to cut before we can assemble the stool. Between the 2 legs I am going to add a stretcher to link them up, and also support the top.